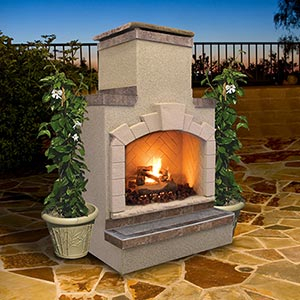 The Cal Flame FRP908 Outdoor Fireplace is made with a 16-gauge galvanized steel frame. Many people spend a large portion of their day tackling the hustle and bustle of everyday life, leaving little to no time for a moment of relaxation. A warm cozy sanctuary created in an outdoor living area could be the ideal solution. Turning a backyard, deck, or patio into a private retreat is simple with the Cal Flame outdoor fireplace and fire pit product line. The products are perfect for lounging under the stars on a cool winter night, or hanging out with friends after a swim on a summer evening. Consumers want products they can enjoy year-round and share with friends. 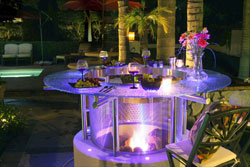 Outdoor fireplaces and fire pits are a perfect solution to hectic schedules and conservative budgets. Integrating Cal Flame hearth products into showroom floors can enhance the overall look and feel of a store and give consumers options for creating magnificent outdoor living spaces. Cal Flame offers a complete line of hearth products that hit all the critical price points. Beautifully designed outdoor fireplaces and fire pits can be customized to fit any décor and are available in a variety of shapes, sizes, and colors. • a liquid propane/natural gas option. Consumers can make a stunning statement at an outdoor gathering with the Cal Flame FPT-G5000 Tempered Glass Table Top Fire pit (pictured, left), adding to the attractiveness of any backyard. • a Piezo ignition system which is a battery-powered electronic ignition on/off switch. It can be customized with your choice of Ameristone Stucco in five different colors, eight Cultured Stone styles, accent trim with Porcelain Tile, or Natural Stone Tile and LED lights.